Learning from mistakes of the past can improve the future; failing to learn and adapt is simply irresponsible and a guarantee of future failures. The NBCI Coordinated Implementation Program (CIP) combines lessons from the past with the science of today to create the largest and best network of bobwhite restoration demonstrations in history. The CIP is more than just a focal area program; it may well be the gateway to the future of bobwhite restoration. lack of patience, perseverance, and follow-through. 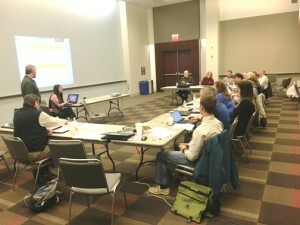 Consensus approach – Dozens of researchers and managers from many states, organizations, and institutions—under auspices of the National Bobwhite Technical Committee—spent two years developing the CIP as the best compromise presently attainable for implementing quail focal areas successfully across the diverse breadth of the bobwhite range. Perfect? No. A milestone advancement? Yes! Adaptive and improvable as we learn more? Absolutely!! active data analysis that complements an adaptive resource management model. Designed for success in near term – The nation’s bobwhite conservation community is backed against a wall. We need success stories sooner than later, and cannot afford continuing disappointments. The CIP is designed to optimize the chances of documenting and showcasing restoration successes over a defined 5- to 10-year time-frame. Understand shortcomings – Even following the best guidance, some CIP focal areas may not perform as hoped. But, the CIP design standards and required monitoring of bobwhites, songbirds, and habitats on both treatment and reference sites will provide vital data needed to begin understanding varied outcomes and illuminating needed habitat improvements. The bobwhite community will benefit from such experience and knowledge, and thus will be able to raise our game at a faster pace. Tangible “shiny thing” – A CIP focal area is a definitive project that offers numerous practical ways for partners to get involved and feel a valuable part of something bigger. Thus, the CIP has proven to be able to attract, coalesce, and motivate varied partners such as national NGOs, local sportsmen’s clubs, researchers, landowners, federal agencies, local college biology clubs, as well as various state conservation agencies. Bigger than bobwhites – The CIP provides a monitoring protocol as well as firm expectations that several priority grassland birds (as determined by each state) be monitored along with bobwhites, to document songbird responses to focal area habitat restoration and management. Being inclusive means CIP is bigger than just bobwhites, and thus is even more important; it also helps boost and diversify partnerships. Restoration path for extirpated areas – CIP provides the first clear roadmap toward and standards for restoring bobwhites in regions where wild bobwhites are extirpated. That need is increasing in several states. Defining “success” – CIP requires a bobwhite population goal be set as a benchmark, thus forcing biologists to confront the difficult and long-debated question of defining a successful bobwhite restoration. A biological success is presently defined in the bobwhite literature as sustaining a fall population of 800 birds over 99 years, a yardstick also referred to as a viable population. A cultural success may be something more, such as a huntable population, or one capable of serving as a source population for translocations. The specific concept of a huntable population is widely variable, depending on state, region, landownerships, and expectations. Attract new funding – The tangible, turnkey CIP package promises quantifiable metrics, reliable data, and measurable outcomes from defined management prescriptions. This uncommon complete package offers the compelling prospect of return on investment, and is already starting to attract new interest and new funding to bobwhite and grassland conservation. Commitment – The CIP expects a minimum 10-year commitment to its focal areas, which is longer than innumerable failed quail focal areas received in the past. Bobwhite restoration at the scale envisioned by NBCI is a generational endeavor; thus, 10 years still is a relative blip, but a longer, improved blip. Competition – The CIP can introduce a new, constructive element—and maybe even some fun!—to bobwhite restoration: a healthy competitive spirit among states, and among CIP focal areas and their partners. 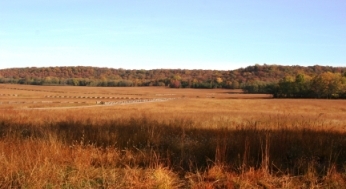 Public interest stories – Each CIP focal area is a story with its own unique combination of landscapes, histories, landowners, partners, personalities, successes, and lessons learned. Each successful CIP story provides another compelling marketing opportunity for native grassland conservation, bobwhite restoration, partnerships and reinvigoration of the treasured bird hunting recreation. Poised to convince – Among the hurdles confronting the NBCI community is winning over a constituency of sportsmen, landowners, agency administrators, commissioners, and politicians who are skeptical of the usual answer that habitat is the solution to the quail problem, while seeing little convincing evidence. The entire CIP is designed as a massive scientific experiment to answer scientific questions, but also to provide convincing contemporary evidence that habitat still produces birds. For various reasons, the list of those who may need convincing is long, including sportsmen, landowners, outdoor communicators, state agency administrators and commissioners, grantors, state legislators, politicians, and federal agency administrators in DC… and even stressed-out, overworked and underappreciated field biologists. Restore hope –The CIP is designed not just to convince skeptics, but also to restore their hope, and thus build stronger foundations of public anticipation, enthusiasm, and support. Without public hope, there is no hope for the NBCI mission. Strong first step – From the beginning, the CIP is envisioned as a jump-start means toward a much bigger and more important end: widespread restoration of sustainable, huntable populations of wild bobwhites and vibrant native grassland ecosystems across at least 25 states. Once the modest-sized CIP focal areas have made their case, the stage is set to magnify the CIP effort to create a larger movement that can replicate such successes on larger focal landscapes and eventually across vast focal regions. One solid step at a time, starting with the CIP focal areas. The NBCI’s CIP is the best and most comprehensive collective effort ever undertaken by bobwhite managers. To date, about 19 to 21 states (depending on how we count) have embraced and are acting on the CIP concept, establishing 24 projects that include 45 focal and reference areas and more than 1,000 bird/habitat monitoring points. Early returns already indicate an average 80+% increase in coveys on managed focal areas compared with the unmanaged reference areas. Those individuals and states stepping up with resolve to adopt and implement the CIP are the new generation of leaders across the entire bobwhite and grassland bird movement. They are the innovators, the seekers of truth—using a transparent, accountable, and adaptable system—about the linkages between best management practices and bird populations. These state/federal/NGO/private leaders are playing central, coordinated roles in the long-term future of bobwhite recovery and in the resurrection of a cherished, if faded, hunting tradition. It is time for the US Department of Agriculture to embrace a native vegetation standard across all its agencies and programs. 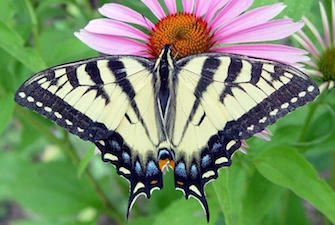 Such a move will be good for the birds, the pollinating bees, the monarchs and many other butterflies. And for soil health, water quality and clean air. And for taxpayers. And, yes, also for producers and landowners. USDA does not keep good data on introduced versus native plantings. 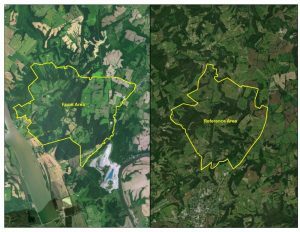 But reading between the lines of USDA data on just one program, NBCI estimates roughly 1.25 million acres of aggressive, introduced vegetation that provides poor habitat was subsidized on private lands across the bobwhite’s range in 2014 by the Environmental Quality Incentives Program. 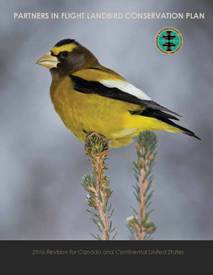 In contrast, NBCI’s annual habitat management inventory documented only about 750,000 acres of private lands bobwhite habitat management fostered by state wildlife agencies that same year (https://bringbackbobwhites.org/download/nbcis-bobwhite-almanac-state-of-the-bobwhite-2014-is-now-available). Across USDA, multiple programs in multiple agencies are working at cross-purposes with themselves: supporting native grassland restoration while subsidizing the spread of aggressive introduced plantings for agricultural and conservation purposes that replace and degrade native habitats. Bottom line: bobwhites and many other at-risk grassland species still are losing ground every year. The waterfowl conservation community figured out decades ago the fundamental dilemma of such an imbalance. A potent concept, known as “No Net Loss / Net Gain,” highlighted the need for a two-fold approach to restore ebbing waterfowl populations. Minimizing wetland losses was necessary before wetland restorations could catch up and begin rebuilding the continent’s total wetland habitat acreage. The duck guys acted and fixed their problem by supporting legislative and regulatory policy reforms for wetland conservation. The quail/songbird/monarch/pollinator guys should take heed. 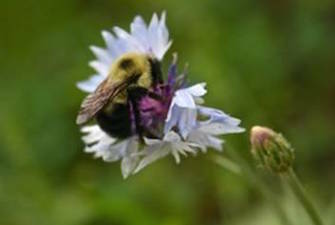 The nation’s native grassland habitats and wildlife populations cannot be stabilized or restored until the federally subsidized losses and degradation are minimized. Quail conservationists have been talking about this problem for many years, with no traction and no resolution. Meanwhile, the major federal public land management agencies already have adopted native vegetation policies – US Fish and Wildlife Service, Bureau of Land Management, National Park Service. Even the USDA Forest Service has a native vegetation policy. But not USDA’s agriculture agencies. 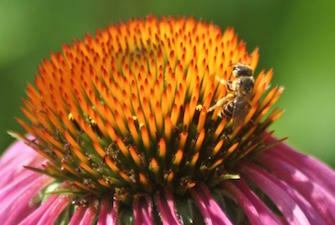 Natives First is NBCI’s national leadership effort to reform USDA’s decades-long tradition of relying primarily on aggressive plants introduced from other continents for conservation and production programs. 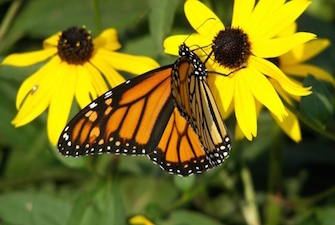 Natives First would establish a new standard at USDA, so that native plants that provide high-quality wildlife habitat would become the default preference for all publicly funded financial and technical assistance programs. Note that our concept is not called “Natives Only.” We know some introduced plants that are not aggressive can provide suitable habitat for some wildlife. We also recognize some specific, narrowly-defined situations may require reliance on introduced plants that provide poor habitat. But those examples are, and should be treated as, just the exceptions. NBCI is circulating a letter to Congress asking for a native vegetation standard at USDA to be included in the 2018 Farm Bill. That community letter has been signed by 50 partners, and more are asking to be added. NBCI also has established a Natives First Coalition, a more enduring alliance of partner groups committed to this cause for the long term. Check out NBCI’s website (https://bringbackbobwhites.org/conservation/natives-first/) and our Natives First Facebook page for more information. We invite you, we need you, to join the Natives First Coalition. The dire native grassland decline has been 75 years in the making; it won’t be solved overnight. But until a native vegetation standard is established at USDA, the problem won’t be solved at all. This is big ball. Adoption of Natives First by USDA could be the single most important conservation action to tilt the nation’s private land playing field in favor of restoring at-risk grassland wildlife. An autumn consumed by personal transition interfered with—well, squashed—any ambitions for bird hunting this season. Thankfully, friends and colleagues have provided tales and pictures of numerous excellent bird hunts for my vicarious fulfillment. My 2017 ended at Orange Beach, Alabama with parents and siblings, for what is becoming a new family holiday tradition. It’s not Midwestern bird hunting, but it’s still a neat area and a needed change of scenery, with fantastic seafood and no crowds this time of year. 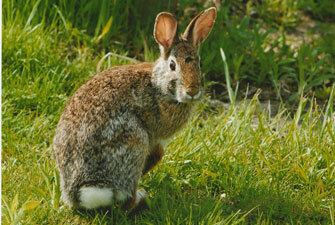 habitats varying from beach, to inland dunes and swales, to pine forest, as far as 1½ miles inland. The day before, on a different trail, I had seen two medium-sized cottonmouths, and earlier on this walk a fair-size gator greeted walkers and bikers. So when I heard unusual, sustained rustling in the leaves under some brush near a lesser-used trail, I approached cautiously to investigate. Imagine my surprise when a full-size covey of bobwhites exploded from under the brush within 5 feet of me, scattering only a short distance to the ample brushy escape cover! 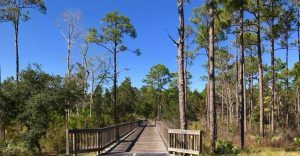 A network of trails at Gulf State Park provide a view of a variety of habitats. The covey was only 1 mile by air from the ocean, and the beachfront condominiums were easily visible. I would not have bet a dime on seeing bobwhites in that location. Even though the habitat technically appears suitable, I just assumed the surrounding landscape was too developed and too busy for bobwhites to be able to hang on. I called the park later and talked with Casey, a staff biologist from Auburn (War Eagle! ), who was jazzed to hear my report. She said releases of penned birds are not allowed, and that a persistent population of wild bobwhites can be heard singing all around the park in summer, but that coveys are rarely seen. When hunting, every single covey of provides a thrilling adrenaline rush; but finding a covey when it is not being sought and is least expected is an extra-special gift. I am banking on my surprise Christmas Covey being an omen for a good 2018! (https://www1.usgs.gov/csas/swap/index.html ). Predictably, I went straight to bobwhites. The first point I noticed from the USGS summary is that bobwhites are the 28th most-frequently-listed SGCN in the nation, out of 657 total SGCNs. Second, bobwhites are the 3rd-most-frequently-listed game species, behind king rail and American woodcock. From follow-up conversations and emails, I’ve learned that Indiana subsequently has administratively acted and recently approved adding bobwhites as a SGCN. Alabama considers bobwhites to be of “moderate” conservation concern, thus not in enough trouble to warrant SGCN status. Missouri and Tennessee added bobwhites in their revised 2015 plan after determining it was legitimate for game species to be designated as SGCNs. Pennsylvania dropped bobwhites in 2015 after officially determining the species was already extirpated statewide in the wild. In Nebraska, bobwhites are doing comparatively well statewide. The attention to bobwhites from eight states that are not participants in the NBCI is interesting and a bit perplexing. NBCI has approached at least four of those states in recent years about joining the Initiative, without success; the five that still list bobwhites as a SGCN seem not to be concerned enough to participate in the NBCI. The obvious question about the three states that removed bobwhites in 2015 is whether the species has been extirpated in those states, too, but no formal declaration has been made. Feel-good stories about bobwhite conservation come too infrequently, thus beg to be shared and appreciated widely. I have maintained from the origins of the NBCI that the grassroots level at the bottom of the metaphorical pyramid is the foundation of bobwhite conservation. Without the vibrant grassroots power of local sportsmen’s chapters, nongovernment conservation organizations, landowners, biology clubs, prescribed fire associations, birdwatchers, hunters, etc. – unified effectively with a common vision and coordinated strategies – the NBCI mission of widespread bobwhite restoration cannot succeed. Add “student artists” to that list of grassroots bobwhite conservationists. Madison Shell, a motivated high school student artist in Simpsonville, South Carolina, developed a special interest in bobwhites that soon was followed by a personal commitment to use her talents to help conserve the troubled bird. 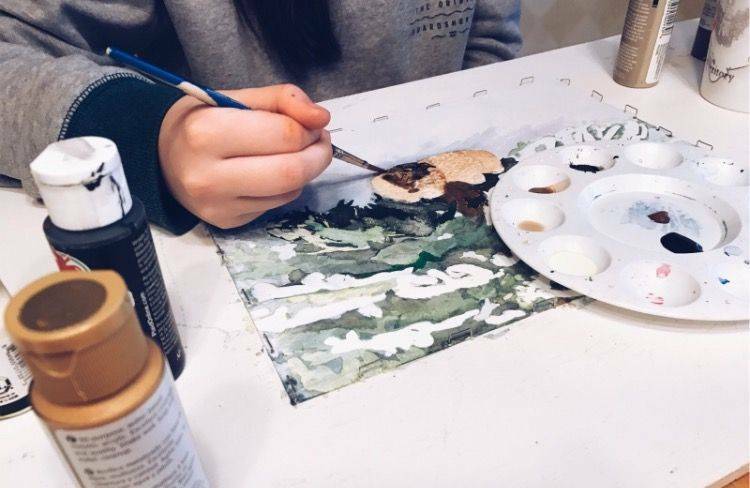 Her high school’s Supervised Agricultural Experiences Project provided the launch pad for her proposition to paint pictures of bobwhite quail and sell them, donating the profits to an organization dedicated to preserving the bobwhite population. Madison did her own research on organizations dedicated to bobwhite conservation, and contacted NBCI early this year to pitch her idea. Our mission at Bobwhite Innovative is to use our creativity to help conserve and protect the bobwhite quail population by creating and selling wildlife paintings of these amazing creatures to raise awareness. We will donate 75% of our profits to the National Bobwhite Conservation Initiative. We are a small business that started as a high school Supervised Agricultural Experiences Project (SAEP) and hope to grow into something bigger. “Through cooperation, education, and teamwork, we hope to impact the bobwhite quail population positively,” Madison pledges on her website at www.bobwhiteinnovative.com. The bobwhite veterans among us are accustomed to – though still grateful for – the typical, stalwart grassroots conservationists who have carried the flag for decades. But there’s something especially gratifying and encouraging about the passion, personal motivation and action of Madison Shell, offering hope that a new generation of conservationists just might be out there, ready to join and carry on the cause for bobwhites and all the other songbirds and pollinators that share its habitat. The bobwhite’s future feels a bit brighter now. 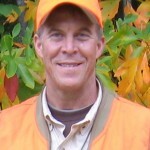 Joseph Roswell Evans, co-founder of Quail Unlimited, died December 9, 2016 at 66 years old in Augusta, Georgia. Much better known as “Rocky,” he and Jerry Allen launched the nation’s first national quail conservation organization in 1981 in Edgefield, South Carolina. Rocky served as its executive vice president, face and fervent voice for 28 years until his retirement in 2009. Prior to 1981, Oklahoma State University had convened two periodic quail research symposia to share and publicize scientific findings. But QU was the first national force for quail conservation that brought the plight of declining bobwhites and other quail to the attention of tens of thousands of hunters, biologists and agencies across the country. QU also was the first to undertake the task of trying to do something about quail declines at a large scale by raising sportsmen’s dollars to hire a national network of professional biologists who worked with local chapters, state and federal agencies, and researchers. Those biologists collectively became one of QU’s most valuable and enduring contributions. The annual QU conventions provided a forum for hundreds of sportsmen and chapter leaders at local and state levels to interact with agency biologists, quail researchers, outdoor writers and others. The rest of the bobwhite conservation world caught up in 1995 with the formation of the Southeast Quail Study Group and completion of the National Bobwhite Conservation Initiative in 2002. 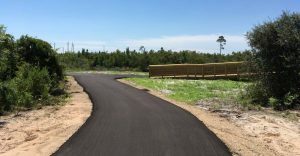 Those developments added state wildlife agency authority, a stronger technical foundation, long-range bobwhite conservation vision, and large-scale strategy to bolster the grassroots work begun by QU. This strategic organization enabled mutual support and collaboration among QU and its sportsmen, state wildlife agencies, quail researchers, and other conservationists at a national scale. That opportunity for mutual support culminated at a pivotal moment in 2006, when Rocky and QU stepped up to pledge critical three-year financial support for the NBCI. “Quail Unlimited is proud to be a partner … in meeting the financial demands necessary to help ensure the long-term success and viability of the NBCI. Our whole organization including our staff, chapters and members strongly endorse and support the NBCI goals,” Rocky said at the time. That timely contribution by QU solved a crucial funding problem and enabled the NBCI to blossom, to better serve the nation’s entire bobwhite community in the long run. Unfortunately, the QU national organization did not fare as well, peaking too soon under the weight of a complex web of leadership and management challenges. Three years later, Rocky retired amid controversial circumstances and imminent bankruptcy of the organization. Upon reflection benefitting from the passage of time, it becomes clearer that Rocky’s aspiration for a broad, cohesive movement for quail conservation was 20 years ahead of its time. When the states and the rest of the quail conservation world began standing up, QU was already trapped in a declining trajectory, unable to capitalize on the new national attention and synergy. The state of bobwhite conservation might now be brighter if the timing of the two trajectories has been better aligned. But a piece of Rocky Evans’ bobwhite conservation legacy lives on in the NBCI, as the next generation endeavors to build on what he and QU set in motion. 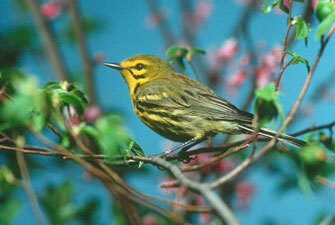 birds common, PIF initially focused on unique and overlooked needs of migratory forest interior songbirds but has gradually broadened to consideration of the full spectrum of North American landbirds. Bobwhite folks long have actively engage the PIF community, motivated by the power of unity and the reality of shared habitats among numerous priority species. PIF folks have been receptive, responsive and mutually engaging, resulting in minimizing the old game/non-game attitudes and barriers that once impeded collective action and progress. The 2016 PIF Plan (www.partnersinflight.org) provides updated information, a refined assessment of priority species and conservation urgency, regional profiles (by joint ventures) and highlights on interesting species or initiatives. As it illuminates that many of the steepest recent declines are among grassland birds, the Plan includes a full-page spotlight on the NBCI and bobwhites, and the native grasslands habitat overlap with priority songbirds such as painted bunting, dickcissel, scissor-tailed flycatcher, field sparrow and loggerhead shrike. Bobwhites are a priority in 11 joint venture features, with pictures and discussion in at least two of those, while the Plan also highlights priority status of other declining resident game birds in numerous places, further erasing old divisions. More important is the substance of the new Plan’s findings. Six species of resident game birds “earned” spots on the PIF Watch List of species of continental concern: Gunnison sage-grouse, lesser prairie-chicken, mountain quail, scaled quail, greater sage-grouse and greater prairie-chicken. Bobwhites “earned” a spot near the top of the PIF list of Common Birds in Steep Decline, with an 83% population decline since 1970. This thought-provoking PIF half-life approach to assessing the conservation urgency of bobwhites and other declining species is simply sobering. But the new PIF Plan can and should be motivating, for it highlights urgent common interests among diverse, capable bird conservation groups. PIF, NBCI, joint ventures, federal and state agencies, and non-government organizations have collective capacity to make positive change if we can double down on our collaborations. Meanwhile, half-lives are ticking away. From the Farmhouse to The White House: Home Run or Fly Out for Bobwhites? Home runs are uncommon in wildlife conservation policy; but when one happens, it can be a game-changer. Much of the future for large-scale bobwhite restoration depends on improving federal habitat conservation policy. Thus, policy is a high priority for the NBCI, even though demonstrable accomplishments are few and far between and require extensive amounts of time and work to achieve. The NBCI and its stalwart community of bobwhite conservationists hit one out of the park one year ago this month. The USDA Farm Service Agency (FSA) finally – after 19 years of technical recommendations and urging by the bobwhite conservation community and the NBCI – approved stand-alone eligibility for corners of center pivot-irrigated crop fields into the Continuous Conservation Reserve Program (CCRP). FSA authorized 250,000 acres for immediate enrollment of pivot corners into the CCRP as a variant of the CP33 field border practice. This $250 million wildlife conservation value comes as a federal “free pass” to the state wildlife agencies and their partners, courtesy of FSA, through the persistence, hard work and leadership primarily of the NBCI and the National Bobwhite Technical Committee (NBTC). This premium bobwhite habitat practice has high potential to make something good out of nothing. In pivot-dominated landscapes, the unirrigated, marginal corners can comprise more than 20%of the total landscape acreage. Thus, this new practice can increase suitable habitat from about 0% to 20% of the center pivot landscape for bobwhites, certain grasslan d birds and pollinators. For context, consider that the new NBCI focal area program – the Coordinated Implementation Program (CIP) – sets a threshold of 25% of a landscape in suitable habitat as the minimum needed to sustain a wild bobwhite population. This new pivot-corner practice alone has the capability to transform a habitat-devoid landscape to grasslands that can support bobwhites. But the best opportunity – even when presented on a silver platter – is no better than its implementation. Some 17.5 million acres of pivot-irrigated cropland exists across 24 of the 25 NBCI states (West Virginia is the only NBCI state with no center pivot irrigation). Yet, one year after this long-sought practice was established, only 15,470 acres of corners have been enrolled, total, across the 24 states. Texas admirably leads the nation with 8,240 acres of pivot-corner enrollment, more than all the other states combined. Undoubtedly, many reasons can and will be pointed out for this paltry level of enrollment and habitat creation. 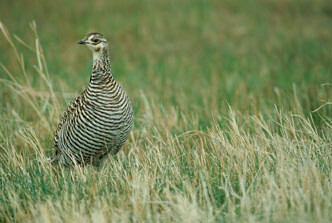 But the bottom line is a prime, hard-earned quail habitat opportunity is being missed. The NBCI and NBTC have done our job, meeting or exceeding expectations. We created a huge new opportunity and secured major federal funding for the states to create bobwhite habitat. To promote the practice, the NBCI created a customizable informative flyer for use by the states and has publicized it in multiple ways. Now it’s up to the states and our federal and NGO bobwhite conservation partners to hit the ball out of the park. Aggressive collaboration among USDA field offices, landowners and local agricultural and conservation organizations is imperative to realize the benefits of center pivot corners for bobwhites, other grassland birds, pollinators and producers. This is no time for our community to strike out on this long-needed and hard-earned pitch down the middle. – they can mean partners, manpower, political supporters, or funders. It is the NBCI vision and unified 25- state strategic plan and its landscape-scale restoration feasibility assessment. It is the growing initiative that is providing unprecedented leadership and national-level capability for implementation. It is the increasingly organized and strengthening alliance of state wildlife agencies, non-government organizations, research institutes, universities, other conservation initiatives, and other state and federal agencies. It is the NBCI’s new Coordinated Implementation Program (CIP), designed to catalyze effective bobwhite focal areas across the states. The broad community of bobwhite conservationists has built all this. They now are beginning to come, in varied forms, some unexpected. A chance observation of a 2014 federal public notice for a new vegetation management plan led to phone calls, which led to a meeting, which led to a unique and previously unforeseen formal partnership for bobwhite and grassland bird restoration. The first official NBCI focal area in Arkansas was established last month on Pea Ridge National Military Park (NMP), a 4,300-acre unit of the U.S. Department of Interior’s National Park Service (NPS). See announcement HERE. I am confident that the NPS had been on the minds of very few NBCI states or quail partners. Likewise, I feel sure that bobwhite restoration has not been on the minds of many NPS employees or administrators. But because the states and the bobwhite community first built it, we have earned the NPS’s attention. They now are coming to be an active partner in a common cause. Due to its overall preservation tradition on national parks, wildlife managers generally overlook the NPS as a potential wildlife conservation partner. But the agency’s national battlefields are different, with a primary cultural mission tied to a specific point in time. The NPS now recognizes that most national battlefields are not authentic representations of the landscapes on which the memorialized event occurred. Vast, mowed fields of fescue are inappropriate, because Civil War-era cattle grazed native forages (fescue hadn’t even been discovered); 19th century forests had been widely thinned out or cut over; fire was common on the landscape; and farm fields were small by today’s standards. In general, the 19th century eastern landscape was bobwhite habitat. More importantly, the NPS now is beginning to act to restore more authentic historical landscapes; i.e., bobwhite habitat. The leadership and staff of Pea Ridge NMP plan to eventually restore more than 2,500 acres of the park into native grassland, savanna and open woodland, all of which will be burned frequently. As a result of the new partnership, the Arkansas Game and Fish Commission is prepared to assist on the park, as well as on adjacent acreages of willing private landowners, to create a bigger quail-friendly landscape. Meanwhile, students and faculty from the nearby Northwest Arkansas Community College already are counting quail and songbirds on the park, while the local Benton County Quail sportsman’s club is prepared to contribute additional resources. With so much help, the Park’s restoration vision can be accelerated, improved and elevated into what could become a bobwhite and grassland bird management showcase, consistent with its cultural mission. With the NPS centennial in 2016, the agency is keen to do some strutting, and is prepared to spend some extra money in the process. Thus, the NBCI already is working with Pea Ridge and regional NPS administrators to expand this unique partnership to the national level. Of all the federal and state land management agencies across the bobwhite’s range, the NPS is emerging as ripe for real partnerships and major progress in a short time. A quick Google count indicates up to a couple dozen national battlefields across several states that might be fertile opportunities. For example, the Pennsylvania Game Commission and Gettysburg NMP just met to begin discussions about establishing that state’s first NBCI focal area using the Pea Ridge partnership as a precedent. So, why the NPS? In short: (1) it has land; (2) it has native habitat restoration ambitions on battlefields; (3) it has management staff and funds (though never enough); (4) it is a willing partner; (5) it increases the total size of the nation’s quail restoration pie; (6) parks are prime places for public education on why and how native grassland habitat management benefits quail and grassland birds; (7) NPS leadership may ignite interest – or at least a competitive spirit – in other land management agencies that can join the nation’s grassland bird restoration effort. Having led with the fanfare, let’s dispense with the elephant: quail hunting on NPS lands is an unlikely outcome of NBCI focal areas on park lands. That reality may initially seem inconsistent with the NBCI’s vision and #1 principle: widespread restoration of huntable populations of wild bobwhites. In a tiny frame of reference, I might agree. In the all-important big picture, however, lack of quail hunting opportunity on NPS lands is a small tradeoff for such a valuable restoration collaboration. Absence of public hunting on NPS lands eliminates the political difficulty of mediating among conflicting and competing sportsmen constituencies. Given the current situation of declining bobwhite populations in every single state in which the species occurs, quail folks need more successes in the near term, wherever we can find them. The NPS is capable of making real conservation contributions toward near-term, habitat-based bobwhite success stories. Bobwhite folks across 25 states built it, and now they are coming … almost as if we had planned it that way!